The Department of Physical Therapy will host an Open House at the Physical Therapy Center on Saturday, April 6 from 10:00 AM to 12:00 PM. Guests are invited to drop-in for an opportunity to learn more about education opportunities in physical therapy at UCA. Informal meet and greet with faculty will be available as well as tours of the PT Center. Dr. Lisa VanHoose, PT, PhD, MPH, Assistant Professor, Department of Physical Therapy, was recently named as a new Board Member for the Arkansas Cancer Coalition (ACC). As a NIH, PCORI, and industry funded researcher, Dr. VanHoose investigates socioecological models of cancer related distress and lymphedema with an emphasis on minority and rural cancer survivorship. Dr. VanHoose served as the 2012-2016 President of the Academy of Oncologic Physical Therapy of the American Physical Therapy Association. She currently provides oncology rehabilitation services through the Ujima Institute, PLLC, as the owner and service provider. The Arkansas Cancer Coalition serves almost 1,000 members. Through acquisition of multiple grant awards, the ACC makes possible the collaboration on ideas that will lead to Arkansas’ next big breakthrough on cancer control. Visit www.arcancercoalition.org. PT Class of 1988 Celebrates 30 Years! 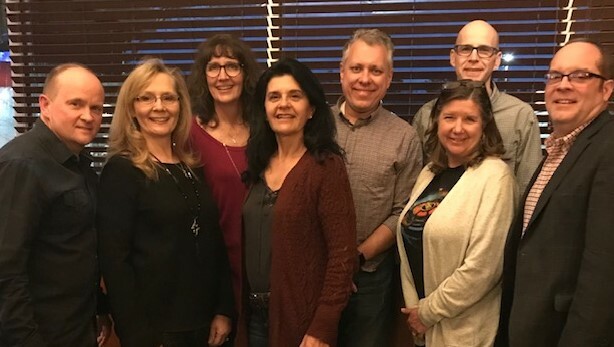 The UCA Physical Therapy class of 1988 celebrated their 30th anniversary recently with a reunion in Little Rock. Members of the class visited in the afternoon at a reception in Maumelle hosted by Andrea Holt Jackson’s mother. Also attending were two faculty who had the privilege of teaching these students, Dr. Bill Bandy and Dr. Nancy Reese. The group also met for dinner in Little Rock. 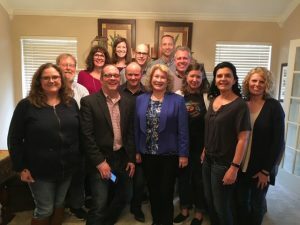 In the first picture, pictured right from left to right in the front row: Amelia Hammaker, Bobby Stone, Ray Hayes, Linda Ealy, Cheryl Easley Scarbrough, Dena Reinbott Hart, Tammy Glidden; and back row: Bill Bandy, Andrea Jackson, Nancy Reese, Mike Scarbrough, Billy Haygood, and Todd Whatley. Pictured below from left to right: Ray Hays, Cheri Vining Hayes, Andrea Jackson, Dena Reinbott Hart, Todd Whatley, Cheryl Easley Scarbrough, Mike Scarbrough, and Bobby Stone. Dr. Nancy Reese, Professor and Chairperson of the Department of Physical Therapy, was informed this week by APTA President, Sharon Dunn, that she is a 2019 recipient of the Catherine Worthingham Fellow award. The purpose of the Catherine Worthingham Fellow designation (FAPTA) is to honor Dr. Worthingham and inspire all physical therapists to attain the high level of professional excellence and impact in terms of advancing the profession she exemplified. The Catherine Worthingham Fellows of the American Physical Therapy Association (FAPTA), the association’s highest membership category, serves as inspiration for all physical therapists to attain professional excellence. This honor is eligible to APTA physical therapist members or life member physical therapists who have demonstrated unwavering efforts to advance the physical therapy profession for more than 15 years, prior to the time of nomination. Dr. Reese is a member of the Neurology Section, Education Section, and Health Policy and Administration Sections of the APTA and past President of the Arkansas Chapter of the APTA. She currently serves on the Board of the Academic Council of American Physical Therapy Association (ACAPT) as Treasurer. Dr. Reese has been the Chairperson of the Department of Physical Therapy since 2004, a member of the faculty since 1986 and a member of the APTA since 1980. She is well-published including numerous articles, book chapters as well two text books each in their 3rd edition. Her leadership at UCA and in the APTA are exemplary. The UCA faculty responded to the news with many heartfelt congrats describing the achievement as “well-deserved”, “an awesome achievement”, and an “incredible honor for an outstanding person”! The FAPTA designation is the highest honor among APTA’s membership categories. Dr. Reese will be honored at the APTA’s NEXT 2019 Conference and Exposition in Chicago, Illinois, June 12-15. Dr. Leah Lowe, Assistant Professor, and Dr. Charlotte Yates, Associate Professor, had an article recently accepted for publication from work with their National Institutes of Health (NIH) concussion grant. Lowe L, Williams DK, Gokun Y, Yates C. Spatiotemporal parameters of adolescent gait while performing a visuospatial memory task. International Journal of Sports Physical Therapy. 2019. UCA will host the APTA Credentialed Clinical Instructor Course on May 17 – 18, 2019 in the PT Center on the UCA campus in Conway. Dr. Misty Booth will present the two-day course approved for 1.6 CEU (16 contact hours). Registration deadline is April 19. See UCA Credentialed CI Brochure and Registration Form. The UCA Marquette Challenge will host a continuing education course at UCA in the PT Center on March 9, 2019. The course will be presented by Dr. Melissa Allen, PT, PhD, DPT, CEEAA and Dr. Anita Killins, PT, PhD, DPT, NCS, C/NDT and is entitled Balance Assessment and Intervention: An Evidence-based Approach to Practice. The lab and case-based course is approved by the AR State Board for 6.75 contact hours. See brochure and registration form at Course Balance Assessment and Intervention 3-9-2019. The following research activities by UCA Physical Therapy faculty and students were recently presented on January 24-26, 2019 at the APTA Combined Sections Meeting in Washington, DC. Some are in collaboration with other institutions. UCA students are marked by an asterisk. Reese, Nancy; Bandy, William; Cole, Anna*; Mayo, Alayne*; Pierceall, Tori*; Pollard, Deanna*; Sweere, Charlotte*. Impact of the Number of Core Faculty FTEs on Physical Therapy Program Outcomes. Booth, Melissa; Stephens, Stacey. Variance in Clinical Instructor Reporting of Caseload Expectations for Physical Therapist Students Using the Physical Therapist Clinical Performance Instrument (PT CPI). Reese, Nancy; Bandy, William; Cole, Anna*; Mayo, Alayne*; Pierceall, Tori*; Pollard, Deanna*; Sweere, Charlotte*. Differences in Physical Therapy Program Outcomes Based on Institutional Classification. Kennedy, Kai; Davenport, Todd; VanHoose, Lisa. Leaky Pipelines & Revolving Doors: Why Diversity & Inclusion in PT Seem Elusive. Pruett, Autumn*; Sayes, Kathryn*; Garrison, Kevin; Lairamore, Chad. The Effect of Transcranial Direct Current Stimulation on Lower Extremity Motor Tasks When Delivered with Two Different Electrode Montages. Lowe, Leah; Hart, Lauren*; Carroll, Chris*; Yates, Charlotte. Frequency of ImPACT Testing for the High School Athlete. Moore, Kelly; Hardin, Autumn; VanHoose, Lisa; Huang, Han-Hung. A Survey of Current Wound Care Education in Entry-Level Doctor of Physical Therapy Curriculums. Dominguez, Maritza*; Lairamore, Chad. Clinical Practice & Education: An Interprofessional Collaborative Experience for Students. Floyd, T; Lairamore, C; Garrison, K; Mennemeier, M; Rainey, J. The Effect of Transcranial Direct Current Stimulation on Lower Extremity Cortical Excitability and Ankle Tracking Accuracy. Flowers, Meredith*; Yates, Charlotte; Lowe, Leah. 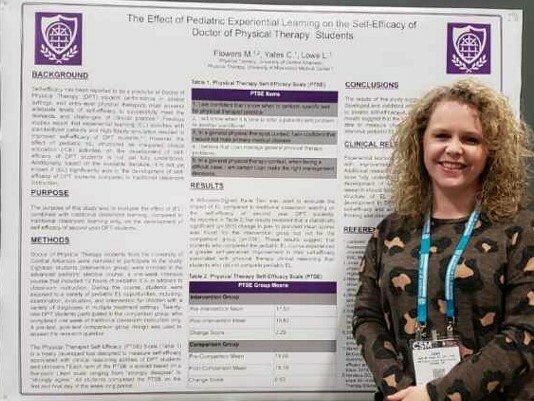 The Effect of Pediatric Experiential Learning on the Self-Efficacy of DPT Students. Tiarks, Nathan*; Gallagher, Michael; Lairamore, Chad; Garrison, Kevin. Blood Flow Restriction Cycling: Preliminary Findings on the Effects on Energy Expenditure, Hemodynamics, and Perception. Students from the DPT Class of 2021 recently took a break from first semester classes to celebrate new friendships with classmates by hosting a Friendsgiving. The class is enjoying life in PT school and lifelong friendships as they bond over practical exams! UCA PT students enjoyed another entertaining Halloween Bash this year. First year students joined second year students (some third years too!) in this annual tradition with great enthusiasm. Thanks to the PT Club for providing a pizza lunch and costume contest. The costumes were as creative as ever with a lot of laughter and time spent together taking a well-deserved break! Second year students soon after took their final exams before leaving for the clinic! Dr. Kevin Garrison recently received extramural funding in collaboration with the Geriatric Research Education and Clinical Center (GRECC). Dr. Garrison is a Co-PI on the 4 year award that totals nearly $1M. Dr. Chad Lairamore, Associate Professor in the Department of Physical Therapy, has been re-appointed by the Federation of State Boards of Physical Therapy (FSBPT) to serve another 3-year term as Co-Chair of the FSBPT Examination Committee. This committee oversees development of the National Physical Therapy Examination. Dr. Larissa Collier, Assistant Professor in the Department of Physical Therapy, recently had a research paper accepted for publication. The following physical therapy faculty and students recently presented research at the Arkansas Physical Therapy Association Optimize Conference held on September 28-29 in Little Rock. UCA students (PhD and DPT) are indicated by an asterisk. Dominguez M*, Lairamore C. Aligning Clinical Practice & Education: An Interprofessional Collaborative Experience for Students. Tiarks N*, Gallagher M, Lairamore C, Garrison K. The Effects of Different Intervals of Blood Flow Restriction Cycling on Energy Expenditure, Hemodynamics, and Perception. Odom B*, Lowe L, Vanhoose L, Yates C. Tracheostomy wound healing in the pediatric population: A retrospective study. Bandy WD, Reese NB, Cole A*, Mayo A*, Pierceall T*, Pollard D*, Sweere C*. Differences In Physical Therapy Program Outcomes Based On Institutional Classification. Hart L*, Yates C, Carter M*, Carroll C*, Lowe L. Frequency of ImPACT testing for the high school athlete. Lowe L, Beck B*, Ripley S*, Wade L*, Yates C. Exploration of two clinical postural control assessments in adolescents with concussion. 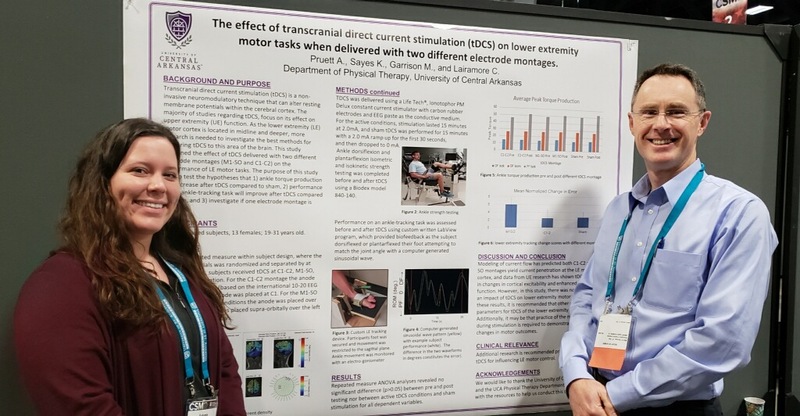 Pruett A*, Sayes K*, Garrison K, Lairamore C. The Effect Of Transcranial Direct Current Stimulation On Lower Extremity Motor Tasks When Delivered With Two Different Electrode Montages. Reese NB, Bandy WD, Cole A*, Mayo A*, Pierceall T*, Pollard D*, Sweere C*. Impact Of The Number Of Core Faculty FTEs On Physical Therapy Program Outcomes. Dr. Chad Lairamore, Associate Professor in the Department of Physical Therapy, was appointed to the Programming Committee – Regional Conference sub-committee for the American Interprofessional Health Collaborative (AIHC). Dr. Steve Forbush, Dr. Bill Bandy, Dr. Kevin Garrison, Dr. Leslyn Graves, Dr. Rachel Roberts have published recently in the International Journal of Sports Physical Therapy. The title of their paper is “Testing infraspinatus and deltoid muscles with new technique to decrease deltoid activity during testing using EMG analysis.” International Journal of Sports Physical Therapy 2018;13:2-9. Drs. Graves and Roberts are alumni from the UCA DPT Class of 2017. Drs. Forbush, Bandy, and Garrison are on faculty in the PT Department. Congratulations to Dr. Steve Forbush – who was notified that he will be receiving the ArPTA Distinguished Service Award at the 2018 ArPTA Awards Banquet in September. “This award is for significant contribution to physical therapy in Arkansas in one or more of the following areas: Public awareness, Administration, Education, Patient Care, or Research.” Dr. Forbush, PT, PhD, OCS, is an Associate Professor and board certified orthopedic specialist in the Physical Therapy Department at the University of Central Arkansas. Congratulations to Melissa Rimple, PT, DPT and Stephanie Sharum, PT, DPT, for completing the UCA Pediatric Physical Therapy Residency Program. Drs. Rimple and Sharum were presented certificates by Dr. Misty Booth, Director of the UCA Pediatric Residency program, during the 2018 UCA DPT Convocation ceremony held on August 10 at Reynolds Performance Hall in Conway. The University of Central Arkansas Pediatric Physical Therapy Residency Program is a full-time residency program offered in cooperation with Arkansas Children’s Hospital and Allied Therapy and Consulting Services. The UCA Pediatric Residency Program is accredited by the American Board of Physical Therapy Residency and Fellowship Education. Pictured left to right are Dr. McGee, Dr. Booth, Dr. Rimple, Dr. Yates, and Dr. Sharum. The Department of Physical Therapy recently announced UCA Foundation Physical Therapy scholarships to DPT students on Friday, August 10 during DPT Convocation at Reynolds Performance Hall. Dr. Kevin Garrison, Interim Chairperson, presented the Joe Finnell Scholarship to third year students in the DPT Class of 2019 (pictured left to right) Amber Allison, Hailey Durham, Sara Eller, Brittany Jones (DPT Class of 2020) and Hannah Sagers. Hannah Sagers was also the recipient of the Thomas Meadows Scholarship presented by Dr. Margaret McGee. Nat and Traci Grubbs and family presented the Madeline Ann Grubbs Scholarship to third year student Troy Brunson of the DPT Class of 2019. The Charlotte Mills Fant Memorial Scholarship was presented by Dr. Sarah Barnett, sister of Ms. Fant, to Treslyn Fletcher a first year student in the DPT Class of 2021. All PT scholarships are a result the continued generous support by PT Alumni and Friends through annual giving. 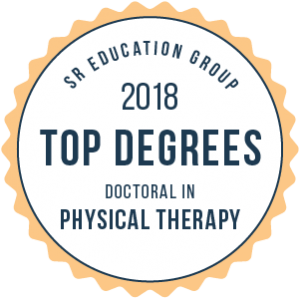 The Department of Physical Therapy recently held DPT Convocation ceremonies for the Class of 2018 on August 10 at Reynolds Performance Hall at the University of Central Arkansas. Dr. Chad Lairamore, Association Professor of Physical Therapy, was the keynote speaker. Dr. Angela Barlow, Dean of the Graduate School, and Dr. Jimmy Ishee, Dean of the College of Health and Behavioral Sciences, greeted the graduates and guests. Fifty-two students completed the UCA Doctor of Physical Therapy program. The class selected Morgan Crowder as the Outstanding DPT Student of the Class of 2018. Dr. Forbush presented the award to Morgan who also served as the Class President of her class from 2015 – 2018. Also during Convocation DPT Student Excellence Awards were announced for students in the Class of 2018 including awards for Leadership, Service, Research, Academics and Clinical Excellence as well as the 2018 PT Foundation Scholarship recipients. Following the Convocation ceremony the graduates and family and friends were greeted by faculty and staff at DPT Reception held in McCastlain Hall on campus. Students in the Class of 2018 were recognized for Excellence in Leadership, Service, Clinical Practice, Research, and Academics. Students are nominated for Leadership and Service Excellence by their peers and faculty. This year’s recipients of the Leadership Excellence award are Joey Baker and Morgan Crowder. Service Excellence Award recipients are Emyleigh Wood, Julie Jenner and Daniel Amaro. Hannah Haney and Tim Wilson received the 2018 Clinical Excellence Award. Research Excellence Award recipients are those students who presented a poster or paper at a state or national meeting. The 2018 Research Excellence Award recipients are Joey Baker, Dorothy Clark, Sam Codemo, Morgan Crowder, Shea Ferguson, Tyalor Guinn, Sarah Higginbotham, Kelsey Kapella, Jennifer Kordsmeier, Anna Lester, Emily Luyet, Phillip Merritt, Jerrod Spencer, Kirsty Stein, Britny Tomlin, and Timia Watson. Thirteen DPT students were also recognized for Academic Excellence in achieving a GPA of 3.9 or above. The UCA Department of Physical Therapy will host the APTA Credentialed Clinical Instructor Course next on November 9 – 10, 2018 at the PT Center on campus in Conway. See registration brochure here UCA CCIP November 2018. Contact Stacey Stephens at staceys@uca.edu or 501-450-5549 if you have any questions. 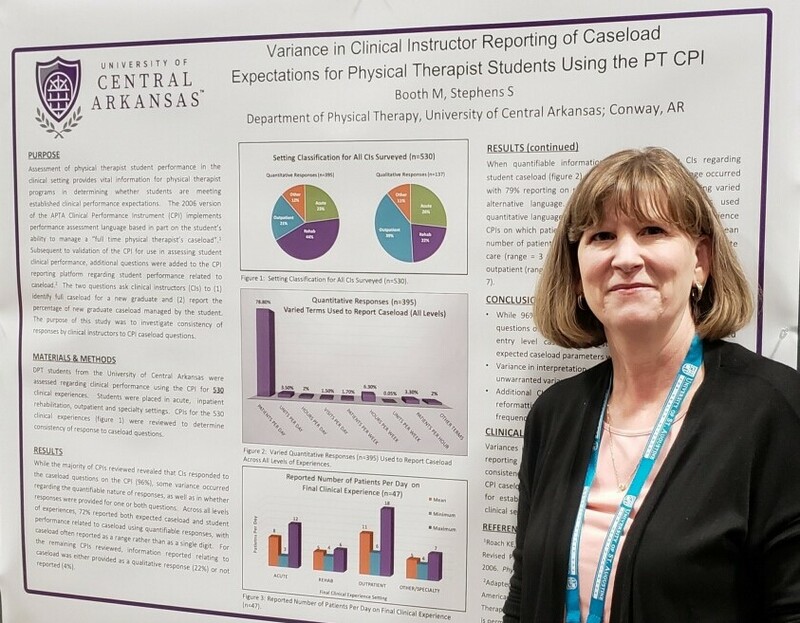 at the University of Central Arkansas, is being honored as a recipient of the Lucy Blair Service Award by the American Physical Therapy Association (APTA). The award will be presented at the NEXT APTA Conference and Exposition on June 17-30, 2018 in Orlando, Florida. Each year APTA honors outstanding achievements on the part of its members in the areas of overall accomplishment, education, practice and service, publications, research, and academic excellence. The Lucy Blair Service Award honors physical therapist members or physical therapist life members whose contributions to APTA are of exceptional quality. Qualifying contributions can pertain to association components, through work on appointed or elected positions and/or in other capacities at the association and component levels. APTA is an individual membership professional organization representing more than 100,000 member physical therapists, physical therapist assistants, and students. Past recipients of the Lucy Blair Service Award from the Department of Physical Therapy at the University of Central Arkansas include Dr. Nancy B. Reese, PT, PhD, MHSA (2011) and Dr. William D. Bandy, PT, PhD, SCS, ATC (2010). The Department of Physical Therapy recently hosted an Open House on Saturday, April 14 from 10:00 AM to 12:00 PM at the Physical Therapy Center. Students interested in apply for the UCA DPT Program are had the opportunity to visit the Physical Therapy Center and learn more about offerings in Physical Therapy at UCA. Many thanks to PT Alumni and Friends who have donated to the Charlotte Fant Memorial Scholarship Fund and all of the Physical Therapy funds this week! It has been a great success. UCA Physical Therapy is stronger with your support! Members of the UCA Physical Therapy Faculty hosted an Alumni Reception on Friday, February 23 from 6:00 PM to 8:00 PM in New Orleans during the APTA Combined Sections Meeting. Many thanks to those who were able to stop by to visit! The Central ACCE Consortium and the UCA Department of Physical Therapy hosted 6 hour CEU Course on Saturday, March 3 for PT and PTA Clinical Instructors at the PT Center on the University of Central Arkansas campus. Speakers included Dr. Charlotte Yates and Dr. Lisa VanHoose of the UCA Department of Physical Therapy who presented information about pain management in infants and adults. Also Dr. Tiffany Huitt of UAMS and Dr. Alana Bartlett of South Arkansas Rehabilitation presented information about mind-body connections in professional education and clinical practice. The Central ACCE Consortium is comprised of the Academic Coordinators of Clinical Education and Directors of Clinical Education for PT and PTA Education Programs located in Missouri, Kansas, Oklahoma and Arkansas. Dr. Maresh, PT, DPT, NCS, ATP, Senior Clinical Instructor, Department of Physical Therapy, and her clinic for spinal cord injured patients was part of an article on living with a spinal cord injury that recently appeared in the Arkansas Democrat-Gazette on February 12, 2018. Dr. Maresh is a board certified clinical specialist in Neurology Physical Therapy from the American Board of Physical Therapy Specialties and is a certified assistive technology practitioner. Dr. Lisa VanHoose, PhD, MPH, PT, Assistant Profession of Physical Therapy, is the recipient of the Early Career Achievement in Health Professions Alumna Award for 2018 by the University of Kansas Medical Center for her contribution to the health care profession, the community and the University of Kansas Medical Center. Alumni Award Recipients will be honored during Alumni Reunion Weekend on October 5-6, 2018. Dr. VanHoose received her PhD in Rehabilitation Science and MPH from the University of Kansas Medical Center. Dr. VanHoose is the Principal Investigator of the Cancer Rehabilitation and Wellness Laboratory (CReW). Dr. Charlotte Yates and Dr. Leah Lowe for being awarded $50,000 in grant funding by National Institute of General Medical Sciences (NIGMS) Institutional Development Award (IDeA) Program (May, 2018-April 2019) for their on-going project on concussion in adolescent athletes. The NIGMS is one of the U.S. National Institutes of Health and supports research that is the foundation for disease diagnosis, treatment, and prevention. Dr. Margaret McGee, Associate Professor in the Department of Physical Therapy, will be presenting a symposium at the APTA NEXT Conference and Exposition 2018, to be held in Orlando, Florida, June 27-30, 2018. The title of Dr. McGee‘s symposium is “Let’s Go! Fitness Testing to Promote Physical Literacy in Children with Disabilities”. Dr. Lisa VanHoose, Assistant Professor in the Department of Physical Therapy, and her research collaborators were awarded a Patient-Centered Outcomes Research Institute (PCORI) Pipeline to Proposal Tier A award. The purpose of the Pipeline to Proposals Initiative is to cultivate the development of proposals with sound scientific rigor and robust patient engagement. PCORI expects the Pipeline to Proposals project will help individuals form new collaborations that can produce meaningful research proposals. The funds that Dr. VanHoose and her team have received will be used to build a partnership of individuals and groups who share a desire to advance patient-centered outcomes research focused on cancer distress screening and care of individuals identified as having distress related to cancer diagnosis or treatment. Dr. Chad Lairamore, Associate Professor in the Department of Physical Therapy, has been named by the Federation of State Boards of Physical Therapy as Co-Chair of the National Physical Therapy Examination (NPTE) Examination Development Committee. The NPTE is the national licensure examination for physical therapists. The Examination Development Committee oversees the item construction and exam review process in order to maintain the validity and reliability of the NPTE. Two individuals from the Department of Physical Therapy were recently elected to represent the Arkansas Physical Therapy Association at the annual House of Delegates of the American Physical Therapy Association (APTA) that meets each June. Dr. Steve Forbush, Associate Professor in the Department of Physical Therapy was elected to a 3 year term as Chief Delegate and Dr. Nancy Reese, Professor and Chairperson in the Department of Physical Therapy, was elected to a two year term as Delegate. UCA Physical Therapy was well represented October 6-8 at the 2017 OPTimize Conference in Fayetteville, AR. Students, faculty, and alumni were involved in presenting research, attending educational sessions from regional and national speakers on innovative ideas and topics in the physical therapy field, and working hard behind the scenes to make sure everything ran smoothly. This is an annual conference that was developed by the Arkansas Physical Therapy Association. #OPTimize2017 #ArPTA #UCADPT. Pictured right are DPT Class of 2019 students from left to right, Brandon Meek, Kelly Vanlandingham, (Dr. VanHoose), Allyson Rose, and Logan DeWhitt, with Dr. VanHoose, one of the UCA research poster presentations. UCA DPT students are featured in the September / October 2017 issue of Healthcare Journal of Little Rock for their recent receipt of the Excellence and Biggest Stretch Awards from the Foundation for Physical Therapy. Students raised $11,002 in the Marquette Challenge. Dr. Darla Cathcart, Clinical Instructor in the Department of Physical Therapy, has had the following peer-reviewed symposium, Novel Approaches to Dilator Therapy, accepted for presentation at the APTA Combined Sections Meeting in New Orleans scheduled for February 2018. Blankenship C, Lowe L. Body weight support treadmill training (BWSTT) for a non-ambulatory child with cerebral palsy who is blind. Floyd J, Sydney B, Light B, Price C, Lairamore C. The effects of transcranial direct current stimulation on cortical excitability and motor behaviors of the lower extremity: a systematic review. Lester A, Clark D, Higginbotham S, Merritt P, VanHoose L. Changes in pain and distress during pivotal cancer care time points. Lowe L, Baker J, Codemo S, Kordsmeier J, Garrison K. ““Y” Balance test using a force plate in high school athletes. Perkins K, Blancett D, Graham T, Young R, Lairamore, C. The effect of transcranial direct current stimulation on ankle torque production when delivered with two different electrode montages. Reese NB, Bandy WD, Rainey J, Baldwin L, Moore K, Razon C. Predictive reliability of admission and DPT program factors on National Physical Therapy Examination (NPTE) scores. Yates C, Ferguson S, Kapella K, Lowe L. Auditory reaction time using the psychomotor vigilance task in male high school athletes. Yates C, Luyet E, Guinn T, Hart L, Lowe L. The effect of a divided attention task on double and single limb support parameters of gait in high school male athletes. The UCA Doctor of Physical Therapy Class of 2017 celebrated with Convocation Ceremonies held on August 11 in Reynolds Auditorium at UCA. Dr. Tiffany Huitt provided the key note address to the graduates. Dr. Huitt is a former Department of Physical Therapy. Wesley Northey was the student speaker from the the Class of 2017. The Department of Physical Therapy recognized graduates of the DPT program as well as the Pediatric Residents who completed the UCA PT Pediatric Residency this year. The UCA Administration offered their words of wisdom to the graduates including President Davis, Dean Ishee of the College of Health and Behavioral Sciences, Dean Barlow of the Graduate School. Associate Provost Jonathan Glenn also attended. A reception for graduates and their families with Department of Physical Therapy faculty immediately followed in the McCastlain Ballroom at UCA. The class of 2017 selected Kelsey Davidson as the 2017 Outstanding DPT Student. Dr. Davidson received the award during Convocation Ceremonies held August 11 at Reynolds Performance Hall. The recipient of the award is selected by the student class. Dr. Davidson served as the President of the PT Club during the 2016-2017 academic year. Dr. Sara Bennett of Texarkana, sister of Ms. Charlotte Fant, presented Candice Miller of the DPT Class of 2020 with the Charlotte Mills Fant Memorial Scholarship. Ms. Miller is the first recipient of the recently endowed memorial scholarship named in memory of long-time Department of Physical Therapy Program Advisor, Charlotte Fant. Dr. Nancy Reese presented the Charlotte Mills Fant Memorial Scholarship plaque that will be permanently displayed in McCastlain Hall at UCA. scholarships to Doctor of Physical Therapy students during 2017 Physical Therapy Convocation ceremonies held on August 11 at Reynolds Performance Hall. Dr. Sara Bennett presented Candice Miller of the DPT Class of 2020 with the first Charlotte Mills Fant Memorial Scholarship; Dr. Nancy Reese presented the Joe Finnell Scholarship to Samuel Codemo, Anna Wargo, and Timia Watson of the Class of 2018 as well as Hailey Durham, Hannah Sagers of the Class of 2019. Dr. Margaret McGee presented the Thomas Meadows Scholarship to Anna Wargo. And, the Grubbs Family including Nat and Tracy with daughter Melissa, presented the Madeline Ann Grubbs Scholarhip to Anna Wargo. The University of Arkansas and the UCA Department of Physical Therapy will host the Credentialed Clinical Instructor Program on September 22-23, 2017 (Friday/Saturday) in Fayetteville, AR. The 16 hour course (1.6 CEU) will be presented by Dr. Misty Booth. Deadline to register is August 25, 2017. Contact Dollie Resh at (479) 713-8600 for more information. Dr. Misty Booth was one of six UCA faculty and staff members who traveled to Pocahontas during June to help with flood relief efforts. All were featured in an article in the Log Cabin Democrat on May 31. The article may be viewed at the following link. We’re proud of Dr. Booth for her service! Dr. Myla Quiben, a graduate of the UCA PhD program in Physical Therapy and a former faculty member at UCA is the 2017 recipient of the Dorothy Baethke-Eleanor J. Carlin Award for Excellence in Academic Teaching from the American Physical Therapy Association. This is a national award given each year to a single individual for teaching excellence in Physical Therapy education. Dr. Quiben is the second UCA graduate and former UCA faculty member to win this award. The first UCA alumnus was Dr. K. Jackson Thomas, who received the award in 2011 as is currently a faculty member at the Medical University of South Carolina. DPT Students recently participated in the American Physical Therapy Associations 2017 APTA Student Membership Challenge, a national membership drive initiative. UCA students were awarded Honorable Mention. The University of Central Arkansas has won the Award of Excellence in the 2016-2017 VCU–Marquette Challenge. UCA physical therapy students raised a total of $11,002 in this year’s Challenge. The University of Central Arkansas DPT students have also won the Biggest Stretch Award in the 2016-2017 VCU–Marquette Challenge. UCA stretched its fundraising base for the greatest increase in funds raised over last year, raising $10,499 more than their total for the 2015-2016 Marquette Challenge. The Marquette Challenge is an annual grassroots fundraising effort coordinated and carried out by physical therapist and physical therapist assistant students across the country to support new investigators in the field of physical therapy research. The Challenge is the Foundation’s signature annual fundraising initiative raising more funds each year than any other Foundation activity. Since its inception, 264 schools have participated in the Challenge, raising over $3.3 million for physical therapy research. Dr. Charlotte Yates, PhD, PT, PCS, Associate Professor of Physical Therapy, is the winner of the 2017 UCA Faculty Research, Scholarship, and Creative Activity Award. 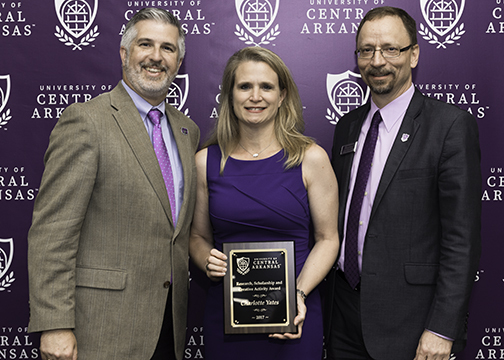 Dr. Yates was recognized by the university for her research excellence at the UCA Employee Service Awards ceremony held on Tuesday, April 18. Her research is currently making a difference in many lives. Her research with preterm infants regarding alleviating pain during medical procedures has influenced new and improved methods of reducing pain and stress of medical procedures for newborns, including changes in the care of pre-term infants in the Neonatal Intensive Care Unit at the University of Arkansas for Medical Sciences. Dr. Yates has also investigated the use of neurocognitive and balance testing for high school football players with concussions. This project will yield important information regarding appropriate testing to determine when such players should be allowed back on the field. Dr. Yates involves students as co-investigators, which has led to numerous co-publications and co-presentations for UCA alumni. UCA will host the Federation of State Boards of Physical Therapy (FSBPT) National Physical Therapy Exam (NPTE) Item-Writer’s Workshop on July 7 – 8, 2017 at the PT Center in Conway. If you are a practicing physical therapist or physical therapist assistant, apply online today at www.fsbpt.org. Previous item-writing experience not necessary; PT or PTA license plus two years experience is required. The course is free and meals are provided. See Regional Item Writer Flyer – Central Arkansas for more information or contact Dr. Chad Lairamore at chadl@uca.edu. The Department of Physical Therapy at the University of Central Arkansas will host a Physical Therapy Open House on Saturday, April 8, from 10:00 AM -12:00 PM. Prospective DPT students are encouraged to attend. Department tours and a chance to ask questions will be available. It is with sadness that we share the news that Mr. Joe Finnell, the founding chairperson of the UCA Department of Physical Therapy, passed away on February 18, 2017. He was 90 years old. Graveside services were held on Saturday, February 25 in El Dorado, AR, by Roller-Chenal Funeral Home; see on-line guestbook at www.rollerfuneralhomes.com/chenal. Mr. Finnell was preceded in death by his wife Mary Isabel Hanna Finnell and son Charles Albert Finnell. He is survived by his son Fergus Finnell and his wife. Memorials may be made to the Joe C. Finnell Physical Therapy Scholarship Fund at UCA, PO Box 4986, 2490 Bruce St, Conway, AR 72035 or at https://uca.edu/giving/. UCA Poster Schedule CSM San Antonio. UCA Faculty and Students to Present at 2017 Combined Section’s Meeting of the APTA on February 15-19 in San Antonio, TX. See Faculty and Students Presenting at CSM. Dr. Leah Lowe will be recognized on February 15 as a Pediatric Certified Specialists during opening ceremonies. Darla Cathcart, PT, DPT, WCS, CLT, is being awarded the Instructor of the Year for CAPP-OB courses, certificate in pregnancy and postpartum Physical Therapy courses provided through the Section on Women’s Health (SoWH) of the American Physical Therapy Association (APTA). She will receive this award at SoWH’s annual business meeting at APTA’s Combined Section Meeting in San Antonio, TX, on February 17th. UCA Doctor of Physical Therapy graduates of 2016 achieved a 92.3% First Time Pass Rate on the National Physical Therapy Exam (NPTE) and an Ultimate Pass Rate of 100%. Second-year DPT student, Timia Watson of the DPT Class of 2018, has been selected to serve on the American Physical Therapy Association Community Service Project Committee. This is a national committee and selection is through a competitive application process. Timia also serves as the treasurer of the UCA Physical Therapy Club, a service organization for UCA physical therapy students. The Department of Physical Therapy congratulates Tamia. Dr. Chad Lairamore, Assistant Professor in the Department of Physical Therapy, has been elected to Distinguished Fellowship of the National Academies of Practice in Physical Therapy (NAP). Outstanding healthcare leaders and practitioners of NAP work together as an interdisciplinary force to influence national health policy, legislation, and promote quality healthcare through cooperative advocacy, practice, education and research. Dr. Lairamore will be inducted during a Gala Banquet in March during the 2017 NAP Annual Meeting & Forum in Philadelphia, PA.
Lisa VanHoose, Assistant Professor in the Physical Therapy department, was awarded the 2016 Jeri F. Walton Service Award by the Oncology Section of the American Physical Therapy Association (APTA). She will receive the award in February at the 2017 APTA Combined Sections Meeting in San Antonio, Texas. Dr. Charlotte Yates has co-authored a publication with Dr. Elizabeth Huett (a 2015 graduate of the UCA DPT program and a 2016 graduate of the UCA Pediatric Physical Therapy residency program). The article has been accepted for publication in Pediatric Dermatology. Huett E, Bartley W, Reasbeck CD, McKitrick-Bandy B, Yates C. 2017. Collagenase for wound debridement in the neonatal intensive care unit: A retrospective case series. Pediatric Dermatology, In press. Dr. Chad Lairamore, Assistant Professor in the Department of Physical Therapy, has been selected to serve on the Communication Committee of the American Interprofessional Health Collaborative (AIHC). The goal of the AIHC is improving the nation’s health through interprofessional education and practice. Dr. Lairamore has also been selected to serve on the National Interprofessional Education Consortium (NIPEC) nominating committee for the American Council of Academic Physical Therapy (ACAPT). Lisa VanHoose, Assistant Professor in the Physical Therapy department, was awarded an UAMS Geriatric Junior Faculty Fellowship. Dr. VanHoose will work with members of the Arkansas Geriatric Education Collaborative on career development and research focused on aging populations. The $40,000 award will support her research project, narrowing the health disparities gap for minority and rural geriatric cancer survivors. Yates C, Lowe L, Williams DK, Aitken M. “Comprehensive dynamic movement assessment for concussion management in high school athletes” NIGMS IDeA Program award P30 GM 110702. May1, 2017- April 30, 2018. $50,000. Dr. Misty Booth has been selected by the American Physical Therapy Association to serve on a task force to guide the conversion of its Credentialed Clinical Instructor Program to an online format. Such a transition will allow improved access to the training for Physical Therapy Clinical Instructors in health care facilities across the U.S. with less travel and on-site time required. The UCA Department of Physical Therapy will host the Credentialed Clinical Instructor Program on May 19-20, 2017 (Friday/Saturday) at the UCA Physical Therapy Center. The 16 hour course presented by Dr. Misty Booth provides 1.6 CEU. A discount is offered to clinical instructors at UCA Clinical Education Sites. The course is limited to 20 participants. Deadline to register is April 20, 2017. See UCA CCIP May 2017 Brochure & Registration Forms. Contact Stacey Stephens at 501-450-5549 or staceys@uca.edu for more information. Dr. Twala Maresh presented a day-long course on Spinal Cord Injury Management in Pediatrics at Arkansas Children’s Hospital on October 29, 2106. The Arkansas Physical Therapy Association (ArPTA) presented their annual awards on September 24 at an event in Little Rock. Dr. Leah Lowe received the 2016 ArPTA Distinguished Service Award. This award recognizes significant contribution to physical therapy in Arkansas in areas of public awareness, administration, education, patient care, or research. 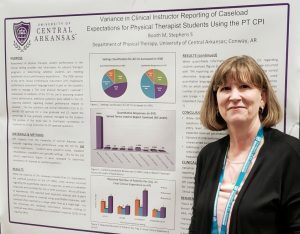 Dr. Lowe was recognized for her significant contributions to physical therapy in Arkansas through her extensive work on conference programming for the annual ArPTA OPTimize Conference, her clinical practice at Pediatrics Plus, and her teaching, research, and service activities as a faculty member at UCA. Dr. Charlotte Yates received the 2016 ArPTA Outstanding Physical Therapist Award. 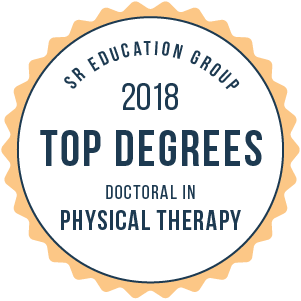 This award recognizes a physical therapist who demonstrates outstanding clinical practice knowledge and skills and exhibits and promotes ongoing professional development. Throughout her 20 year professional career, Dr. Yates has demonstrated an exceptional drive for advancing the profession through clinical practice, teaching, research/scholarship, and service. She is an outstanding contributor to pediatric clinical practice and pediatric research, and an inspiration to developing clinicians and researchers. Several physical therapy faculty members (bold) and students have had research papers accepted for presentation at the Combined Sections Meeting of the American Physical Therapy Association in San Antonio, TX in February 2017. Dr. Lisa VanHoose has recently had a symposium accepted for presentation at the American Physical Therapy Association Combined Sections Meeting which will be held in San Antonio, TX in February 2017. The title of her symposium is “Lymphedema Risk Reduction: Best Practices”. King, Krystal; Jenner, Julie; Wargo, Anna Cathryn; Cathcart, Darla B. Interventions for Primary (Lifelong) and Secondary (Acquired) Vaginismus: A Review of the Literature. Moix J, Koenig K, Booth M, Reese NB. The Use of Focus on Therapeutic Outcomes (FOTO) Tool to Measure Clinical Outcomes in DPT students. Lowe L, Montgomery A, Spinelli A, Choate J. Equipment selection: decision making using the International Classification of Functioning, Disability, and Health. Smith M; Choate J, Sharum S, Lairamore C. A Comparison of Two Electrode Montages for Transcranial Direct Current Stimulation (tCDS) to the Lower Extremity Motor Cortex. Huett E, Bartley W, McKitrick-Bandy B, Yates C. Collagenase for wound debridement in the neonatal intensive care unit: A retrospective case series. Odom, B; Yates C. Post Peripheral Intravenous Infiltration and Extravasation Injury Methodology: a retrospective study. Floyd T; Lairamore C. The effects of Transcranial Direct Current Stimulation (tCDS) on cortical excitability and motor behaviors of the lower extremity; a systematic review. Yates C, Mitchell A, Huett E, Hall RW. Neonatal Electrical Stimulation of Acupuncture Points: Can Alternative Therapy Relieve Heel stick Pain in Neonates? Johnson RL, Larson C, Black LL, Doty KG, VanHoose L. Significance of Nonphysical Predictors of Distress in Cancer Survivors. . 2016 Oct 1;20(5):E112-7. The Distress Thermometer (DT) is a well-validated tool that is frequently used in patients with cancer to screen for general distress and to generate referrals. However, a majority of the DT problem list items relate to physical concerns; this may lead to psychosocial issues being overshadowed.The purpose of the current study is to examine the endorsement rates for nonphysical items, as well as the relationship between these items and overall DT scores. The following research article has been accepted for publication – a collaborative paper between physical therapy and psychology faculty members that is a result of our College’s interprofessional education efforts. Authors: Lairamore, Chad; Martens, Heather. Title: The role of student adaptability in interprofessional education, Journal: Journal of Interprofessional Education & Practice. Dr. Chad Lairamore of the Department of Physical Therapy recently spoke as part of the Ask the experts panel: Best Practices on post stroke rehabilitation at the 17th Annual Geriatrics and Long Term Care Update at the University of Arkansas for Medical Sciences on Friday 9/23/2016. Dr. Charlotte Yates recently had an article accepted in Acta Paediatrica. This publication is the result of a multi-year, multi-site (UCA, UAMS, Stanford University) randomized control trial (RCT) that also involved preliminary research to obtain FDA approval for use of the device in a neonatal population. The background research, carried out by Dr. Yates and Dr. Leah Lowe, generated the following publication: Yates C, Mitchell A, Lowe L, Lee A, Hall RW. Safety of Noninvasive Electrical Stimulation of Acupuncture Points (NESAP) during a routine neonatal heel stick. Medical Acupuncture. 2013; 25(4):285-290. PMC: 3746213. DOI: 10.1089/acu.2012.0952. The RCT was just accepted for publication : Mitchell A, Hall RW, Yates C, Williams DK, Anand S. Does Noninvasive Electrical Stimulation of Acupuncture Points (NESAP) reduce heelstick pain in neonates? Acta Paediatrica, In press. Dr. Bruce Mendelson will present “A Cadaver Anatomy based Approach to the Clinical Anatomy of Sports Injury Rehabilitation” for PT Alumni Weekend and UCA Homecoming on Saturday, October 22. The course will be held from 8:30 – 3:00 in the UCA Gross Anatomy Lab and is approved by the AR State Board for 5 contact hours. Dr. Mendelson is a former UCA PT faculty member and physical therapist currently practicing in Oregon. In recent years, he has taught the Advanced Anatomy course in the UCA DPT program. Click here for course brochure and registration information for this course. The UCA Department of Physical Therapy will host the Credentialed Clinical Instructor Program on November 4-5, 2016 (Friday/Saturday) at the UCA Physical Therapy Center. The 16 hour course presented by Dr. Misty Booth provides 1.6 CEU. A discount is offered to clinical instructors at UCA Clinical Education Sites. The course is limited to 20 participants. Deadline to register is October 5, 2016. See November 2016 Brochure & Registration. Contact Stacey Stephens at 510-450-5549 or staceys@uca.edu for more information. Dr. Leah Lowe, Assistant Professor of Physical Therapy, has become a Certified Pediatric Specialist by the American Board of Physical Therapy Specialties as of June 2016. This increases the number of Certified Pediatric Specialists on faculty at UCA to four, providing excellent support for our Pediatric Residency Program. Dr. Reese was interviewed by the local paper regarding the recent ranking of the UCA Physical Therapy program. The article (UCA Physical Therapy Department receives top ranking _ TheCabin) is also available at on-line at this link. On June 7, 2016, the American Physical Therapy Association House of Delegates approved RC 8-16. The motion identifies oncologic physical therapy as a new clinical specialty within the field. Assistant Professor Lisa VanHoose and Past President of the Oncology Section of the APTA was instrumental in the proposal submission and passage of the motion. UCA DPT students and faculty recently held Georges for Georges fundraiser on July 5, 2016 to raise money for the Foundation of Physical Therapy’s Marquette Challenge to fund physical therapy research. Each professor had a jar for quarters that the students could fill. To prevent being doused the professors had to match each quarter in their jar with $1.00. This fundraiser raised over $1,200 for physical therapy research. DPT Students recently volunteered for Arkansas’ first ever adaptive triathlon. The event’s purpose is to raise awareness and funding for Leaping Beyond’s adaptive sports programs. Children with all disabilities ages 6-21 years were invited to participate. Pediatric therapists available along with volunteers from the community volunteered to ensure inclusion, confidence, and completion of the adaptive triathlon. The event was held on June 4, 2016 at the University of Arkansas. For more information, please contact Cristina Frey, PT, DPT at cfrey@leapingbeyond.com or visit Leaping Beyond. UCA PT Students recently received the Most Creative Fundraiser Award for the 2015-2016 Pittsburgh-Marquette Challenge by the Foundation of Physical Therapy. UCA DPT students decorated secondhand sweaters for Christmas and sold them in a a surprise brown bag. In a news release dated 6-21-2016, the Foundation for Physical Therapy announced the UCA student’s award and reported that students from 150 schools raised a record $354,320.00 to support physical therapy research. UCA students were recognized on June 9th at the APTA’s NEXT Conference and Exposition in Nashville, TN. With heavy hearts, we share the news of the unexpected passing of Charlotte Fant on February 15, 2016. She has been a friend and valuable asset to the Department of Physical Therapy for many years. She will be missed both personally and professionally. Ms. Fant joined the Department of Physical Therapy in October of 2004. She served as academic advisor for Pre-Physical Therapy and was the advisor for the UCA Pre-Physical Therapy Club. Ms. Fant was a finalist for UCA’s Employee of the Year for 2010 and 2011 and was named UCA Employee of the Year for 2012. A memorial service was held on the UCA campus on February 25, 2016. The Charlotte Mills Fant Memorial Scholarship Fund has been established in her memory. If you wish to make a donation you may click here. UCA Physical Therapy faculty and students recently attended the annual Combined Sections meeting of the APTA held in Anaheim, California. Yates C, Mitchell A, Huett E, Hall W. “Neonatal Electrical Stimulation of Acupuncture Points: Can Alternative Therapy Relieve Heel Stick Pain in Neonates? (1) Yates C, Mitchell A, Hood C, Glendenning J, Hall RW, Carroll J. Does Infant Positioning Influence Cardiorespiratory Parameters in Preterm Infants? (2) Huitt E, Mitchell A, Leonard E, Hall RW, Yates C. Comparison of outcome measures for assessment of acute pain for term infants. The UCA Department of Physical Therapy will host the Credentialed Clinical Instructor Program May 13-14, 2016 (Friday/Saturday) at the UCA Physical Therapy Center. The 15 hour course presented by Dr. Misty Booth provides 1.5 CEU. A discount is offered to clinical instructors at UCA Clinical Education Sites. The course is limited to 20 participants. Deadline to register is April 13, 2016. See UCA CCIP MAY 2016 Brochure & Registration Form. Contact Stacey Stephens at 510-450-5549 or staceys@uca.edu for more information. Dr. Twala Maresh, Senior Clinical Instructor in the Department of Physical Therapy, was recently appointed as the physical therapy consultant for the Arkansas Trauma and Rehabilitation’s TRIUMPH (Tele-Rehabilitation Interventions Through University-based Medicine for the Promotion of Healing) call center. The Triumph call center is a 24/7 service linking primary care and emergency physicians, as well as individual Arkansans, to cutting edge clinical information for the care and treatment of spinal cord injury. It offers phone-based or interactive-video-based, on-the-spot nurse/physician-to-physician consultation as well as 24/7 patient and family support. 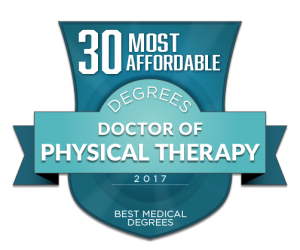 Dr. Maresh serves as the physical therapist expert for this program, offering expert advice on physical therapy and rehabilitation for individuals with SCI to physicians and other health care professionals in Arkansas. The UCA Department of Physical Therapy recently hosted an Open House in the Physical Therapy Center on Friday, October 30, 2015. Guests were able to tour the PT Center and meet Department of Physical Therapy students and faculty from 3:00-6:00 PM. The Open House was also open to PT and PTA alumni visiting Conway for UCA Homecoming Weekend. The 2015 PT Alumni Weekend CEU course was presented by Dr. Staffan Elgelid entitled “What PT can incorporate from Yoga. Or, how to Yogafy what we already do in PT” on Saturday, October 31. This 5.5 contact hour course from 9:00-4:00 includes lab activities. Staffan is the co-author of Yoga Therapy for Stress and Anxiety, which was recently released on September 8. The UCA Physical Therapy Department recently hosted the APTA Credentialed Clinical Instructor Program presented by Dr. Misty Booth on November 13-14. The next course is being planned for April, 2016. The Department of Physical Therapy welcomed the incoming DPT students during Orientation held on August 19, 2015. The PT Club and DPT Class of 2017 along with faculty, staff, and UCA administration provided a warm welcome and an opportunity to get to know each other before starting their classes on August 24. The Department of Physical Therapy recently awarded PT student scholarships on Friday, August 7 during DPT Convocation at Reynolds Performance Hall. Nat Grubbs and family presented the Madeline Ann Grubbs Scholarship to Taylor Wood and Chris Rigsby, both third year students in the DPT Class of 2016. Dr. Nancy Reese presented the Joe Finnell Scholarship to second year students Sarah Smith and Chelsea Dyson as well as third year students Chris Rigsby and Taylor Wood. Dr. Margaret McGee presented the Thomas Meadows Scholarship to Rachel Roberts, a second year DPT student. All PT scholarships are a result the continued generous support by PT Alumni and Friends through annual giving. The DPT Class of 2015 celebrated their graduation on Friday, August 7 during the Physical Therapy Convocation ceremony held in Reynolds Performance Hall. Dr. Twala Maresh, Senior Clinical Instructor, provided the keynote address for the 2015 DPT Class of 56 graduates. The class selected their classmate Michael Pharis to provide the Student Address to the class. Elizabeth Huett and Sarah Walker were announced as the recipients of the Outstanding DPT Students for 2015, an award bestowed upon them by their classmates. 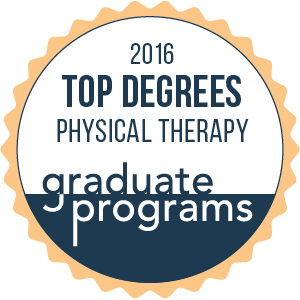 The Department of Physical Therapy also recognized students in the DPT Class of 2015 with twenty-eight Student Excellence Awards. Cortney Barnhill, DPT 2015 Class President, was presented the Leadership Excellence Award. Sarah Walker received the Clinical Excellence Award, an award which is nominated by clinicians. Kristian Foster and Erin Petty were presented the Service Excellence Award. Kristian was recognized for her work with the PT Club and Erin was recognized for her work coordinating participation in the Vilonia tornado relief effort. Eight students were presented the Research Excellence Award including Caleb Cross, Julie Foerster, Kristian Foster, Carly Hood, Elizabeth Huett, Joanna Sence, Nathan Tiarks, and Sarah Walker. In addition, sixteen students received the Academic Excellence Award for achieving a 3.90 or above GPA for the DPT program. Students, family, guests, and faculty attended a reception immediately following. UCA Commencement ceremonies were later held in the Farris Center. The Department of Physical Therapy will participated in the DPT Education Virtual Fair for pre-DPT Students on April 28-29, 2015. This event is free to pre physical therapy students. UCA will participate again in Spring 2016. The Department of Physical Therapy recently hosted an open house on Friday, April 17, 2015 from 2:30-4:30. Guests had the opportunity to meet with faculty and students while touring the Physical Therapy Center during this recent drop-in event. The Physical Therapy Center is located on Bruce Street next to the football stadium. Save the Date: The next UCA Homecoming and PT Alumni Weekend will be held on Saturday, October 31, 2015. More information to follow. UCA recently hosted the APTA Credentialed Clinical Instructor Program (CCIP) on Saturday and Sunday, March 14-15, 2015 at Summit Medical Center in Van Buren, AR in conjunction with the Carl Albert State College PTA Program. The course was presented Dr. Misty Booth. Dr. Darla Cathcart, PT, DPT, WCS, Instructor in the Department of Physical Therapy, was recently named as the Women’s Health Section 2015 Volunteer of the Year. The Award for her dedication, support and commitment to serve in the Entry Level Curriculum Task Force was presented during the APTA Combined Sections Meeting 2015 in Indianapolis by Wendy Featherstone, PT, DPT, President of the Women’s Health Section of the APTA. Team-based Learning in a Gross Anatomy Laboratory Improves Academic Performance, Student Perceptions of Teamwork and Fosters Quality Learning in Team Interactions. This platform presentation for the Education Section was presented by Anita Killins, UCA PhD in Physical Therapy student, and Dr. Tiffany Huitt. The Effect of Varying Forearm, Elbow and Shoulder Position on Glenohumeral Extension ROM Measures of Asymptomatic Subjects in the Supine and Prone Positions. Tiarks N*, Sense J*, Taylor D, Fletcher J. Comparison of Isokinetic Resistance and Cross-sectional Area of the Supraspinatus Using Musculoskeletal Ultrasound. Steve Forbush, Sarah Walker*, Katie Wallace*, Jessica Winberry*, Ashton Witt*. Dr. Darla Cathcart of the Department of Physical Therapy taught the course “Fundamentals of Pregnancy and Postpartum Physical Therapy” to Chilean physical therapists in Santiago, Chile, on Oct 4-6. The course, sponsored through the Section on Women’s Health of the American Physical Therapy Association, had a full cohort of 40 participants. In addition, Physical Therapy faculty members at Universidad del Desarrollo in Santiago, Chile, for the second year in a row, expressed interest in establishing a physical therapy student exchange with the University of Central Arkansas. UCA Physical Therapy Alumni Weekend was recently held on October 25, 2014. Dr. Booth presented a continuing education course regarding clinical education that was free for current clinical instructors. The PT Department also hosted a Tailgate Lunch on Saturday at the PT Center. The PT Club and the Department of Physical Therapy recently hosted Family Day at UCA on Saturday, September 20, 2014. Students currently enrolled in the DPT program and their families visited the Department, toured the PT Center and enjoyed a cookout provided by PT Club. More than 200 people attended the annual event. The DPT Class of 2014 celebrated their graduation on Friday, August 8 during the Physical Therapy Convocation held in Reynolds Performance Hall. Dr. James Fletcher, Associate Professor of Physical Therapy was the keynote speaker for the class of 52 graduates as well as student speaker Dana Bledsoe from the class of 2014. Alicia Austin was announced as the recipient of the class selected Outstanding DPT Student for 2014. Also during the Convocation ceremony, eighteen Student Excellence Awards were presented. Alicia Austin was presented the Leadership Excellence Award while Monique Pridgin received the Service Excellence Award. Four students were presented the Research Excellence Award including Alicia Austin, Lauren Floyd, Nick Garza and Monique Pridgin. Three students received the Clinical Excellence Award,which is nominated by clinicians, including Jonathan Curry, Logan Dockery, and Deborah Sanders. In addition, eight students received the Academic Excellence Award for achieving a 3.90 or above GPA and one student, John “Tyler” Floyd received a 4.0 GPA for the DPT program. Students, family, guests, and faculty attended a reception immediately following. UCA Commencement ceremonies were later held in the Farris Center. The Department of Physical Therapy has awarded six physical therapy student scholarships for 2014. Each scholarship is a result of gifts made generously by alumni of the physical therapy program. Recipients were recognized during the 2014 Physical Therapy Convocation ceremony held on August 8 at Reynolds Auditorium at UCA. Dr. Nancy Reese, Chairperson of the Department, presented the Joe Finnell Physical Therapy Scholarship to Cortney Barnhill and Laura Claussen, both 3rd year DPT students and to Christopher Rigsby and Taylor Wood, both second year DPT students. Dr. Margaret McGee, Associate Professor, presented the Thomas Meadows Memorial Scholarship to Taylor Wood. Nat Grubbs and his family presented the Madeline Ann Grubbs Scholarship to Laura Claussen. Students from the Physical Therapy Club volunteered in Vilonia, AR on May 1, 2014 to assist families devastated by the tornado that struck central Arkansas on April 27. Students spent the day assisting families and listening to their stories. The service minded students of the PT Club were more than willing to assist their community during this time of need. Several faculty and staff members were also able to volunteer during UCA’s week-long disaster relief effort, “Bear Boots on the Ground”, on May 5 – 9 in Mayflower and Vilonia. Dr. Darla Cathcart, faculty member in the Department of Physical Therapy and Dr. Lori Mize, alum, adjunct faculty member and guest lecturer, were recently interviewed for an article published in PT in Motion, May 2014, featuring Women’s Health. The article discusses women’s health PTs use of evidence-based research to take the pelvic floor out of isolation. Dr. Garrison, Kristian Foster and Julie Forester, Poster Presentation CSM 2014. Faculty and students of the Department of Physical Therapy recently attended the 2014 Combined Sections Meeting (CSM) of the American Physical Therapy Association on February 3-6 in Las Vegas, NV. Forty-one students in the Doctor of Physical program including 19 third-year students, 21 second-year students and one first-year student as well as three PhD in Physical Therapy students attended along with eight members of the PT Faculty who presented programming and research. The four-day meeting set a new record in attendance for the annual event with over 11,000 attendees, speakers and guests. Highlights included two faculty members providing educational programming, one platform presentation and eight students presenting research. Dr. Twala Maresh, DPT, PT, NCS, ATP, Senior Clinical Instructor in the Department of Physical Therapy, is a board certified neurology physical therapy specialist and an Assistive Technology Professional. Dr. Maresh presented an educational program for the Neurology Section entitled Assistive Technology to Promote Optimal Aging for People with Spinal Cord Injuries. Dr. Darla Cathcart, DPT, PT, WCS, Clinical Instructor in the Department of Physical Therapy, is a board certified women’s health physical therapy specialist. Dr. Cathcart presented an educational program for the Women’s Health Section entitled Perinatal Psychosocial Considerations. 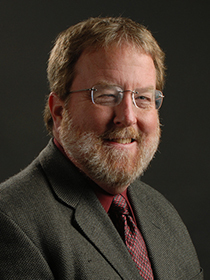 Dr. Cathcart recently joined the Department in 2013. Dr. Tiffany Huitt, PhD, Assistant Professor of Physical Therapy, provided a research platform presentation completed entitled A Team-Based Learning (TBL) Experience In Gross Anatomy Laboratory Improves Physical Therapy Student Perceptions of Teamwork for the Education Section with Dr. Anita Killins, DPT, PT, C/NDT who is a PhD in Physical Therapy Student at UCA. Dr. Kevin Garrision, PhD, PT, Associate Professor in the Department of Physical Therapy, presented a research poster with second-year Doctor of Physical Therapy students Julie Forester, Kristian Foster, Taylor Frix, Eric Goldberg and Bobby Gragston entitled Accuracy of The Simi Aktisys 2-D Motion Analysis System During Over Ground, Sagittal Plane Gain Analysis Varies By Joint and Distance From Camera. Dr. Leah Lowe, PhD, DPT, PT, a 2013 PhD in Physical Therapy graduate and Dr. Charlotte Yates, PhD, PT, PCS, Associate Professor in the Department of Physical Therapy, and third-year DPT Students Alicia Austin, Lauren Floyd, and Monique St. Pierre Pridgin presented a research poster entitled Safety of Noninvasive Electrical Stimulation of Acupuncture Points (NESAP) During a Routine Heel Stick with with . Drs. Lowe and Yates also presented a poster entitled Functional Progression In A Child With TBI After Initiation of Early Mobility In The PICU: A Case Report as well as a research poster entitled Treadmill Training With Partial Body Weight Support In Ambulatory Children With Developmental Delay: A Pilot Study with J. Ferguson. Dr. Steven Forbush, PhD, PT, Assistant Professor in the Department of Physical Therapy, presented a research poster entitled EMG of Deltoid Activity in Various Standard Tests of the Supraspinatus compared with a New Diagonal Horizontal Adduction Test. Jennifer Long, PT, a student in the PhD in Physical Therapy program at UCA presented a research poster with co-investigators Jim Hoyme, PT, a UCA Physical Therapy Alumnus, and Dr. Nancy Reese, PhD, PT, Professor and Chairperson in the Department of Physical Therapy, entitled A Retrospective Analysis of Functional Outcomes Comparing Two Physical Therapy Models: Traditional Physical Therapy Only vs. Physical Therapy and Personal Training Collaborative Care. Dr. Misty Booth, DPT, PT, PCS, Clinical Instructor II in the Department of Physical Therapy , Dr. Leah Lowe, PhD, DPT, PT, a 2013 PhD in Physical Therapy graduate, and Dr. Charlotte Yates, PhD, PT, PCS, Associate Professor in the Department of Physical Therapy, presented a research poster entitled Can massage therapy be used to induce sleep in preterm infants? with co-investigators S Shephard and RW Hall. Dr. Leah Lowe and Dr. Ruth Ann Mathis each recently earned the Doctor of Philosophy degree in Physical Therapy from UCA and were recognized during Winter Commencement exercises held on December 14, 2013. Dr. Mathis is a 1998 MS in PT graduate from UCA. Dr. Mathis received her undergraduate degree from UCA and was a member of the UCA Honors College. Dr. Mathis’s major professor in the Department of Physical Therapy was Dr. David Taylor. She currently teaches in the Department of Physical Therapy at Harding University. Dr. Mathis successfully defended her dissertation on October 8 entitled “The Effect of Exercise Training Intensity on Physical Fitness and Physical Function in People with Type 2 Diabetes: A Randomized Clinical Trial” . Dr. Lowe is a 2006 DPT graduate from UCA. Dr. Lowe also received her undergraduate degree from UCA and was a member of the UCA Honors College as well. She currently practices pediatric physical therapy in Conway. Dr. Lowe’s major professor in the Department of Physical Therapy was Dr. Charlotte Yates. Dr. Lowe successfully defended her dissertation on November 4 entitled “Treadmill Training with Partial Body Weight Support in Ambulating Children with Developmental Delay”. The UCA Doctor of Physical Therapy Program first admitted students in 2003 to begin the 36 month program. Thirty-four students graduated in August of 2003. In 2013, the first Doctor of Physical Therapy Class of 2003 celebrated their 10th anniversary with a class reunion dinner held during PT Alumni Weekend on October 26. Half of the 34 member class attended the event. The physical therapy class of 1973 recently celebrated their 40th anniversary at a reunion dinner held October 25 during PT Alumni Weekend . Eleven of the 15 member class were reunited – some for the first time since 1973- since departing State College of Arkansas when the PT school was located at the “old” Baptist Hospital in Little Rock. Alumni and Guests were able to tour of the UCA Physical Therapy Center and Gross Anatomy lab during an open house and reception held earlier that evening. The Department of Physical Therapy hosted a CEU course regarding healthcare reform presented by Jim Hoyme entitled “Some Will Win…Some Will Lose. I Prefer to Win. Do You View Healthcare Reform as a Threat or an Opportunity?” The course was held as a part of PT Alumni Weekend on Saturday, October 26 and provided 4 hours of continuing education. Participants enjoyed a breakfast followed by the Physical Therapy cookout celebrating PT Alumni Weekend during UCA Homecoming. Kickoff for the game is 3:00 p.m. Click here for registration UCA Alumni Course Brochure 2013 . Students, family and staff celebrated the second annual DPT Family day on October 12, 2013. The PT Club hosted a luncheon and baggo tournament. Students had the opportunity for their families to meet their classmates, faculty and tour the PT Center as well as enjoy tailgating prior to the UCA football game. Students from the class of 2014, 2015 and 2016 attended. The Department of Physical Therapy has awarded six physical therapy student scholarships for 2013-2014. Each scholarship is a result of gifts made generously by alumni of the physical therapy program. Recipients were recognized during the 2013 Physical Therapy Convocation ceremony held on August 9 at Reynolds Auditorium at UCA. Dr. Nancy Reese, Chairperson of the Department, presented the Joe Finnell Physical Therapy Scholarship to Tyler Floyd and Brittany Zielstra, both third year DPT students and to Cortney Barnhill and Carly Hood, both second year DPT students. Dr. Margaret McGee, Associate Professor, presented the Thomas Meadows Memorial Scholarship to Brittany Zielstra. Nat Grubbs and his family presented the Madeline Ann Grubbs Scholarship to Tyler Floyd. The DPT Class of 2013 celebrated their graduation on Friday, August 9 during the Physical Therapy Convocation held in Reynolds Performance Hall. Dr. Bill Bandy was the keynote speaker for the class of 55 graduates as well as student speaker Gabe Harris from the class of 2013. Hunter Platt received the outstanding DPT Student Award for 2013. Seventeen students received the Academic Excellence Award for achieving a 3.90 or above GPA, seven of whom received a 4.0 GPA. Seven students received the Research Excellence Award, three received the Clinical Excellence Award, three received the Service Excellence Award and 2 received the Leadership Excellence Award. Students, family, guests, and faculty attended a reception immediately following. UCA Commencement ceremonies were later held in the Farris Center. The APTA Credentialed Clinical Instructor Program hosted by UCA Physical Therapy was held on September 20-21, 2013. Dr. Misty Booth presented the course. Dr. Charlotte Yates, Assistant Professor, presented a platform presentation entitled “Benefits of Kanagroo Care in Preterm Infants for Pain, Stress, and Cardiorespiratory Parameters” at the 2013 Combined Sections Meeting of the APTA . DPT students Eric Everson, Robin Smith and Anna Drinkwitz were co-authors and also attended the meeting held on January 23 in San Diego. Dr. Chad Lairamore, Assistant Professor, presented a poster entitled “Functional Electrical Stimulation Increases Tibialis Anterior Muscle Activity for Patients With Neurological Injury”. 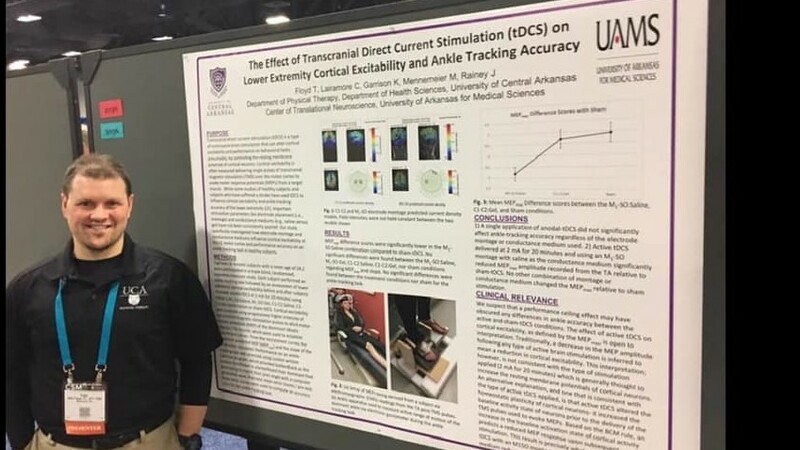 Third year DPT Student Ashley Roughton presented a poster entitled “The Effect of Peripheral Electrical Stimulation on Reaction Time and Cortical Excitability” with co-author Laura Argetsinger and faculty members Dr. Chad Lairamore and Dr. Tiffany Huitt, Assistant Professor. Dr. Steve Forbush, Assistant Professor, presented a poster entitled “Comparison of Contractions Between a New Technique of Supraspinatus Muscle Testing and Commonly Used Techniques of Testing Through the Use of Ultrasound Imaging” with co-authors D White, W Smith and third year DPT Students Vada Harrell, Dustin Howard, Josh Huffman, Divine Kuja and Eric Seaman. Dr. Leah Lowe, DPT Alumnus of 2006 and current PhD student, presented a poster entitled “Transcutaneous Electrical Nerve Stimulation (TENS) in Neonatal Swine: A Safety Study to Assess Skin Integrity and Cardiorespiratory Parameters” with Dr. Charlotte Yates and co-authors A. Mitchell and RW Hall. Dr. Lowe is currently employed at Pediatrics Plus Therapy in Conway. Also, Yasser Salem, an alumnus of the PhD program and current Associate Professor of Physical Therapy at the University of North Texas Health Sciences Center in Fort Worth, presented two platform presentations entitled ” A Multi-Year Observational Study of Community-based Exercise Programming for People With Parkinson Disease” and “Effects of Aquatic Exercises on Mobility Function and Quality of Life in Individuals With Multiple Sclerosis: A Randomized Controlled Trial”. Two of UCA’s recent DPT graduates, Dr. Shannon Ayers and Dr. Karee Davis have had an article accepted for publication in the Journal of Student Physical Therapy Research. The article is titled Comparison of Lower Extremity Anterior Compartment Muscle EMG When Using the Nintendo Wii Fit™ and BAPS Board™: a Repeated Measure Trial. The DPT Class of 2012 celebrated their graduation on Friday, August 10 during the Physical Therapy Convocation held in Reynolds Performance Hall. Lindsey Ludford Baskerville was announced as the Outstanding DPT Student for the DPT Class of 2012, an award voted on by members of the 2012 class. Also during the Convocation ceremony, eleven Student Excellence Awards were presented. Tabitha Rivers was presented the Leadership Excellence Award while LaRoya Doss received the Service Excellence Award. Four students were presented the Research Excellence Award including Alicia Austin, Lauren Floyd, Nick Garza and Monique Pridgin. Two students received the Clinical Excellence Award, which is nominated by clinicians, including Lindsey Ludford Baskerville and Elizabeth Davis. In addition, seven students received the Academic Excellence Award for achieving a 3.90 or above GPA for the DPT program. Students, family, guests, and faculty attended a reception immediately following. UCA Commencement ceremonies were later held in the Farris Center. The Department of Physical Therapy has awarded five physical therapy student scholarships for 2012. Each scholarship is a result of gifts made generously by alumni of the physical therapy program. Recipients were recognized during the 2012 Physical Therapy Convocation ceremony held on August 10, 2012 at Reynolds Auditorium at UCA. Dr. Nancy Reese, Chairperson of the Department, presented the Joe Finnell Physical Therapy Scholarship to 3rd year students Konrad Siemek, Robyn Smith and Michael Wood. Robyn Smith was also the recipient of the Thomas Meadows Memorial Scholarship presented by Dr. Margaret McGee, Associate Professor as well as the recipient of the Madeline Ann Grubbs Scholarship presented by Nat Grubbs and his family. The Log Cabin Democrat has published an article regarding the history of UCA physical therapy written by UCA archivist Jimmy Bryant. The physical therapy program officially began in 1970 and graduated 16 students in the first class in 1972. The article includes quotes from original papers from the program’s founder Mr. Joe Finnell as well as interviews with Dr. Nancy Reese, Dr. Leah Lowe and two current third-year DPT students Kane Moix and Robyn Smith. The article appears in the October 29 issue of the paper as well as on-line at the following link. Nancy Bond, Administrative Assistant for the Department of Physical Therapy, is named Employee of the Quarter for the third quarter of 2012 for the university. Ms. Bond joined the Department in June of 2008 and has been a valuable asset, great professional and coworker since. The first physical therapy class of UCA is celebrating its 40th Anniversary. The Department of Physical Therapy is hosting a special reunion dinner on Friday, November 2 in Conway for the class of 1972. Open House and tours are planned for 5:30-7:00 at the PT Center also on November 2. Charlotte Fant, MS, CHES, Program Advisor in the Department of Physical Therapy was selected by the university as the 2012 Employee of the Year. Ms. Fant was also a finalist for Employee of the Year in 2010 and 2011. Since 2004 Ms. Fant has led the Department’s advisement of the BS in Health Science degree which includes over 400 students as well as mentoring the PrePT Club. In addition to advising students from UCA and other colleges and universities regarding the DPT program, Ms. Fant coordinates events throughout the year that bring hundreds of students to the Department. These events have been described as “one of the best and engaging departmental campus tours” by parents of prospective students. Ms. Fant accomplishes tasks with zeal. “We could not accomplish our mission without her excellent work”. Her contributions to the university and its students are significant and invaluable. She treats everyone with dignity and respect. Ms. Fant serves on the Staff Senate working tirelessly to enhance communication within the UCA community as well. She is a devoted fan and dedicated employee who is by far an asset to the university. Charlotte Yates, PhD, PT, PCS, Assistant Professor in the Department of Physical Therapy, was a 2012 Finalist for the UCA Teaching Excellence Award. Dr. Yates’ teaching responsibilities include Neuroscience, Integumentary, Pediatrics and the Pediatrics Elective coursework as well as mentoring Pediatric Residents and PhD students. Dr. Yates has “the great ability to take extremely complex subject matter like that contained in Neuroscience and convey it to students in a way that makes it understandable and applicable to their future careers as physical therapists.” Students praised her teaching excellence based on her inspiration, motivation, engagement, and enthusiasm as well as going above and beyond by providing one-on-one assistance, opportunities for shadowing and serving as role model for future physical therapists. Her focus on her students both as scholars and human beings has garnered respect, admiration, and appreciation from her students and peers. The Department of Physical Therapy hosted the APTA Clinical Instructor Education and Credential Course on Friday and Saturday, April 27-28, 2012. Dr. Misty Booth served as the course instructor. Nearly 55 DPT students recently attended the Combined Sections Meetings of the APTA held in Chicago on February 8-11. The APTA has notified Nancy Reese that she has been awarded the APTA Lucy Blair Award – the highest award for service in our Association. She will officially receive her award during a ceremony at APTA Annual Conference in Baltimore in June. This award is a huge accomplishment for Dr. Reese and for UCA! The Lucy Blair Service Award is given to individuals who show outstanding contribution of service at the National, Regional, and State level of the American Physical Therapy Association on the basis of the results of an individual’s service and not merely the duration or continuity of that service.” Each year – 5-6 members are recognized. Dr. Reese is the second individual from the State of Arkansas to receive the important award. Congratulations to the 2011 Outstanding DPT Student Park Tipton! Park was selected by his classmates and recognized on August 12 during the Physical Therapy Convocation Ceremony held in Reynolds Performance Hall. Physical Therapy Student Scholarship recipients for 2011 were also announced. Nat Grubbs and his wife Traci presented the Madeline Ann Grubbs Scholarship to Morgan Purkiss of the 2012 DPT Class. Dr. Margaret McGee presented the Thomas Meadows Scholarship to Ashley Roughton of the 2013 class. Dr. Nancy Reese presented the Joe Finnell Scholarship to Elizabeth Davis, Class of 2012 and Gabriel Harris and Ashley Roughton, both of the 2013 class. Pictured right from left to right are Ashley Roughton, Gabriel Harris, Elizabeth Davis and Morgan Purkiss. The Department of Physical Therapy Faculty recognized DPT Graduates for newly created Excellence Awards to recognize exceptional academic, clinical, research and service achievements. Park Tipon was the 2011 Service and Leadership Excellence Award Recipient. Erica Cason received the Clinical Excellence Award based on clinical instructor nominations. The Research Excellence Award recipients were Allison Burba Horgan, Brittany Sexson, Jill Womack and Park Tipton. The Academic Excellence Award recognized five students who maintained a 4.0 GPA throughout the DPT curriculum including Erica Cason, Joshua Eaves, Brittany Sexson, Park Tipton and Jill Womack. Graduates of the 2011 Doctor of Physical Therapy program were honored on Friday, August 12 at the University of Central Arkansas. DPT Students family and guests attended the Physical Therapy Convocation ceremony in Reynolds Performance Hall followed by a reception in the Student Center Ballroom from 3:00-5:00. Convocation guest speakers will include Dr. Steven Forbush of the UCA PT Faculty and Paul Kuipers of the DPT Class of 2011. In addition to the Outstanding DPT Student and Scholarship awards, the Department will present, for the first time, awards for Academic Excellence, Research Excellence and Service and Leadership to the DPT class of 2011. Later, the University Commencement Program was in the Farris Center. The Department of Physical Therapy will be hosting a CEU course entitled SEMG Sequence Assessments – A straight forward approach to applied Kinesiologic – EMG evaluations for clinicians presented by Todd Shewman with Noraxon UCA, Inc. The course is a hands-on course for integrating surface EMG into movement assessment. The course will be on Saturday, August 6 from 8am – 4:30pm. Contact Dr. Kevin Garrision at kgarrison@uca.edu for more information about course registration or to RSVP. The Department of Physical Therapy hosted the APTA Clinical Instructor Education and Credential Course on Friday and Saturday, September 16-17, 2011. Dr. Misty Booth presented the course. Physical Therapy Alumni Weekend held on Saturday, October 29 featured Nat Grubbs course entitled Clinical Update: Rehabilitation of Common Hip and Knee Conditions. Topics included (1) The ACL Epidemic: Causes, Prevention and Rehabilitation, (2) Patellofemoral Joint Rehabilitation: A Concise Yet Comprehensive Overview and (3) Emerging Trends in Hip Arthroscopy: Practical Rehabilitation Implications. The Department also hosted a tailgating cookout in front of the PT Center from 3:00-5:00 for all PT Alumni and their guests prior to the UCA Homecoming Football game at 6:00. Dr. Jeff Nolen, 2010 DPT Graduate and Dr. Margaret McGee, Associate Professor of Physical Therapy recently published an article along with Dr. Hao Liu of the University of North Texas Health Sciences Center in Fort Worth entitled “Comparison of gait characteristics with a single-tip cane, tripod cane, and quad cane” in the Journal Physical and Occupational Therapy in Geriatrics, 2010; Early Online. Dr. Wen Wang, Assistant Professor in the Department of Physical Therapy recently received the 2011 NIH/ INBRE Arkansas Faculty Grant for $21,563 entitled “Role of Myeloid HIF-1a in Diabetic Wound Healing. ” The study will take place between May 1 and August 1. Dr. Wang will serve as the primary investigator for the proposed study that is to determine whether myeloid HIF-1a protein regulates diabetic wound healing in vivo using a mouse model with a myeloid-selective HIF-1a deficiency (HIF-1a KO) to study wound healing. Dr. Wang completed the 2010 NIH/ INBRE Arkansas Faculty Grant as the primary investigator entitled “Macrophage-Endothelial Co-Culture System as an In Vitro Dermal Angiogenesis Model in Wound Healing” which looked at developing a macrophage-EC co-culture system as an in vitro dermal wound angiogenesis model to study wound healing. Charlotte Fant, MS, CHES, Program Advisor for the Department of Physical Therapy was recently honored as a finalist for the 2011 UCA Employee of the Year during the UCA Service Awards Ceremony held on April 19. This is the second year in a row for Ms. Fant to receive this honor. She serves as the Advisor for the Pre Physical Therapy Club in addition to her duties as program advisor for all pre Physical Therapy students and all UCA BS in Health Science-Physical Therapy Emphasis majors on campus which includes nearly 250 students. Wen Wang recently presented “Ginkgo biloba and Insulin Resistant Syndrome – A Clinical Study” at the Yunnan Agricultural University in China on March 22, 2011. Dr James Fletcher, Associate Professor and Dr. Kevin Garrison, Assistant Professor along with Drs. Hao Liu and Clayton Holmes of the University of North Texas Health Science Center in Fort Worth recently had an article published entitled: “Bilateral absence of quadrates femoris and semimembranosus” in the International Journal of Anatomical Variation. 2011;4:40-42. Park Tipton, SPT, Doctor of Physical Therapy Student in the DPT Class scheduled to graduate in August 2011 presented research completed with former UCA faculty member Dr. Hao Liu, now of University of North Texas Health Science Center in Fort Worth and Dr. Clayton Holmes also of the University of North Texas Health Science Center. Their abstract and poster presentation entitled “Effect of a Selected 6-Form Tai Chi on Improvement in Balance and Quality of Life Among Older Adults” was presented at the American Physical Therapy Associations Combined Sections Meeting held February 9 -12 in New Orleans, LA. Nancy Reese, Professor and Chairperson of the Department of Physical Therapy, was recently elected in November to the Board of Directors of the Academic Council, a newly formed organization of physical therapy programs within APTA. Dr. Reese was elected as Treasurer of this organization that will serve as the authoritative voice of physical therapy education in the United States. Dr. Bandy recently received news that he is the recipient of the Lucy Blair Service Award from the American Physical Therapy Association. He will be recognized in June during the APTA Honors and Awards Reception at PT 2010 in Boston. The purpose of the Lucy Blair Service Award is to acknowledge and honor physical therapist members of the Association whose contributions to the Association as a whole have been of exceptional value. Lucy Blair was the first recipient of the award which was established in 1969 to honor dedication, devotion, and outstanding service to the American Physical Therapy Association. Bill Bandy, PhD, PT, SCS, ATC, Professor of Physical Therapy, was honored with the Lifetime Achievement Award from the Sports Physical Therapy Section of the American Physical Therapy Association during the awards ceremony at the 2010 American Physical Therapy Associations Combined Sections Meeting held February 17-20 in Las Vegas, NV. The award is to honor a Sports Physical Therapy member whose contributions to the specialty of sports physical therapy through leadership, influence and achievements have been demonstrated for over 25 years. Dr. Bandy is a recent past board member of the American Physical Therapy Association and currently the Editor-in-Chief of the North American Journal of Sports Physical Therapy. View this UTube Video http://www.youtube.com/watch?v=tRej_sar9G4 for sights and sounds from the August 13 University Commencement Ceremony held in the Farris Center. 2010 DPT Graduate, Tyler Morehart, delivered the keynote student address. Also on August 13, the Class of 2010 and their guests, UCA Administrators, and PT Faculty honored the DPT Graduates. Dr. Lance Grahn, Provost, provided words of wisdom. Dr. Charlotte Yates, Assistant Professor of Physical Therapy, delivered the keynote address. Dr. Hattlestad, Dean of the College of Health and Behavior Sciences and Dr. Elaine McNiece, Associate Provost and Dean of the Graduate School presented class certificates. Dr. Misty Booth, Director of the Pediatric Residency, presented the pediatric residency certificates to Devon Clark and Keely O’Dell, UCA’s first residents. Dr. Nancy Reese, Professor and Chairperson of Physical Therapy, presented the Joe Finnell PT Student Scholarship to Erica Cason, Kaitlyn Stambaugh and Joshua Eaves, all of the DPT Class of 2011. Dr. Reese also presented the Thomas Meadows Memorial Scholarship to Morgan Purkiss, DPT Class of 2012. Nat Grubbs, his wife and daughters presented the Madeline Ann Grubbs Scholarship to Park Tipton, DPT Class of 2011. Dr. Misty Booth presented the 2010 ArPTA Outstanding Student Clinician Award to John Montgomery, 2010 DPT Graduate. Dr. Steven Forbush, Assistant Professor of Physical Therapy, presented the 2010 Outstanding DPT Student Award to Shane Irgens. DPT Class President, John Montgomery, presented the Faculty gifts that included two charcoal grills for tailgating and a UCA Physical Therapy banner that can be used at community events such as Rollin’ Round the Rim. The ceremony closed with a Benediction lead by Ryan Ottenger. A reception for graduates and guests immediately followed in the Reynolds Auditorium Balcony. The Department of Physical Therapy hosted Physical Therapy Alumni Weekend during UCA Homecoming on October 30. Faculty, PT students, guests and alumni from 1980, 1982, 1984, 1997, 1999, 2007 and 2009 visited during the luncheon. Close to 90 guests attended the tailgating cookout held on the patio of the PT Center. The Department began hosting PT Alumni Weekend during UCA Homecoming in 2007. It is a great opportunity to visit with classmates and faculty prior to the UCA football game. Please plan to join us next year! Dr. David Taylor, Associate Professor and Dr. Bill Bandy, Professor recently published the following article along with recent 2010 DPT graduate Dr. JD Whittemore. 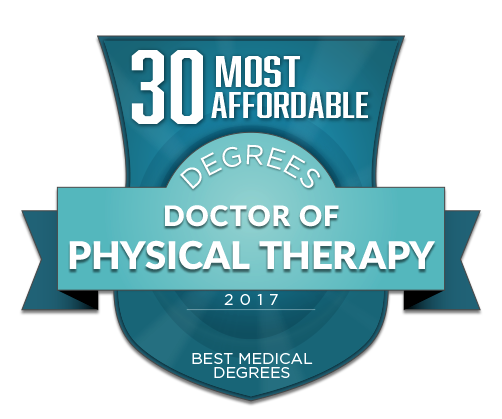 J. David Taylor, PhD, PT, William D. Bandy, PhD, PT, SCS, and Joe D. Whittemore, DPT, PT. Test-retest Reliability and Minimal Detectable Change of a Novel Submaximal Graded Exercise Test in the Measurement of Graded Exercise Test Duration. Journal of Strength and Conditioning Research, October 20, 2010 (Epub ahead of print). Dr. Lairamore, PhD, PT, has been appointed by the Federation of State Boards of Physical Therapy to the National Physical Therapy Examination (NPTE) Task Force. This task force will be working on new content outlines for the NPTE. The Federation of State Boards of Physical Therapy develops and administers the NPTE for both physical therapists and physical therapist assistants in 53 jurisdictions – the 50 states, the District of Columbia, Puerto Rico, and the Virgin Islands. These high-stakes exams assess the basic entry-level competence for first time licensure or registration as a PT or PTA within the 53 jurisdictions. Dr. Yates, Assistant Professor of Physical Therapy and Dr. Nancy B. Reese, Professor and Chairperson of Physical Therapy recently had a paper published in Brain Research Bulletin. Liu H, Skinner RD, Arfaj A, Yates C, Reese NB, Garcia-Rill E. L-dopa effect on frequency-dependent depression of the H-reflex in adult rats with complete spinal cord transection. Brain Research Bull. 2010; In press. Dr.Yates, Assistant Professor of Physical Therapy and Dr. Kevin Garrision, Assistant Professor of Physical Therapy recently had a paper published in Translational Neuroscience. Yates C, Garrison MK, Charlesworth A, Reese NB, Garcia-Rill E. Novel therapies for spinal cord injury (SCI). Translational Neuroscience. 2010 ; In press. Dr. Yates, Assistant Professor of Physical Therapy and Dr. Kevin Garrision, Assistant Professor of Physical Therapy along with third year DPT Students Allison -Horgan and Brittany Sexson recently learned that the following abstracts have been accepted for presentation at the 2011 American Physical Therapy Association’s Combined Section Meeting in New Orleans, LA in February. Yates C, Garrison MK, Burba-Horgan A, Franz J. Outcome measures for exploring the mechanisms of hyper-reflexia and spasticity that develop post SCI in the rat and the effects of passive exercise intervention on each outcome measure. American Physical Therapy Association Combined Section Meeting; New Orleans, LA; February, 2011. Garrison MK, Yates C, Charlesworth A, Burba-Horgan A, Sexton B. Regional Cx-36 changes following complete SCI and interventions in the rat. American Physical Therapy Association Combined Section Meeting; New Orleans, LA; February, 2011. The UCA Pediatric Physical Therapy Residency Program, a joint venture between UCA, Arkansas Children’s Hospital and Allied Therapy and Consulting Services, received news this month that the program has successfully achieved credentialing from the American Board of Physical Therapy Residency and Fellowship Education as a post-professional pediatric residency program. The initial credential is effective July 31, 2010 and in effect for five years. A credentialed residency program promotes standards of quality and consistency in the teaching and practice of physical therapy. The credentialing process is voluntary and the UCA program is currently only one of six pediatric physical therapy residencies in the nation. The 12 month program is designed for practicing physical therapists to gain focused training, education, and mentorship in a variety of pediatric settings. The first two UCA residents will complete the program in August and will be recognized at the Physical Therapy Convocation Ceremony on August 13 at 3:00 in the Reynolds Performance Hall at UCA. Misty Booth is the Director of the pediatric residency program and can be reached at 501-450-5543 or mbooth@uca.edu. Wen Wang, PhD, MD was recently awarded an INBRE (IDeA Networks of Biomedical Research Excellence) Grant for Summer 2010. Dr. Wang will be working with Martin Hauer-Jenson, MD, PhD, FACS of the Department of Pharmaceutical Sciences, Surgery, and Pathology at UAMS to develop a wound healing model. Dr. Wang is interested in wound healing associated with diabetes. The Arkansas INBRE is funded by the National Institutes of Health. Next Course is April 23-24, 2010 at the UCA Physical Therapy Center and sponsored by the UCA Department of Physical Therapy. See Brochure and Registration Agreement and Dossier for Participants. This two-day course provides 1.5 CEU and valuable information for clinical instructors. Shane Irgens, DPT Class of 2010, was recently elected to the 2009-2010 American Physical Therapy Association’s Student Assembly Board of Directors. Irgens attended APTA National Student Conclave held in Miami on October 30-November 1 during which he campaigned for the national office. The Student Assembly is a component of the American Physical Therapy Association comprised of all student members currently at 15,775 members. The Student Assembly is governed by an elected Board of Directors which consists of a President, Vice President, Secretary, Treasurer, Director, Student PT Delegate and Student PTA Delegate, all of whom are available to discuss issues affecting the Association and the physical therapy profession. Several first, second, and third year students attended APTA National Student Conclave held in Miami on October 30-November 1. This national conference is held annually specifically for students of physical therapy for programming, workshops and social events as well as Student Assembly elections. 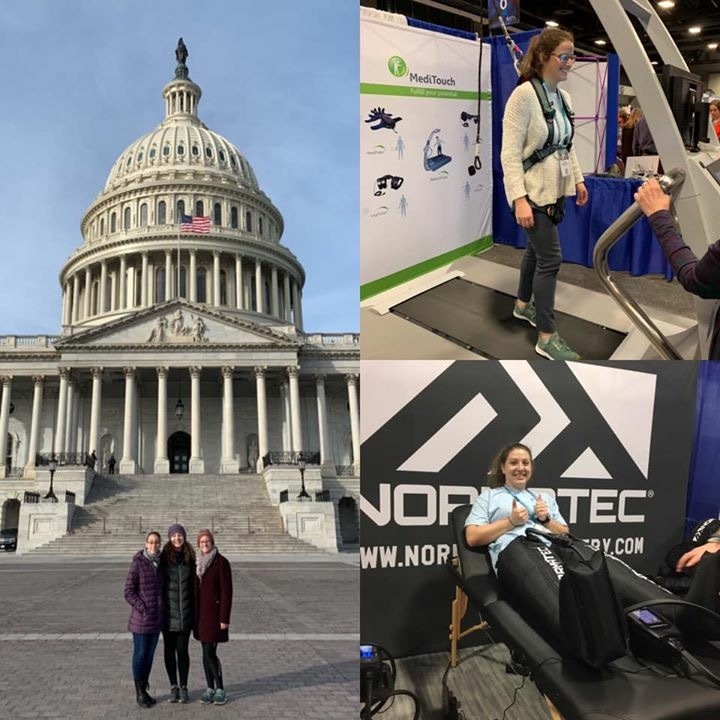 Upon return, students reported that it was amazing to meet so many PT students, attend workshops that they actually understood and meet APTA leaders. According to the APTA website, Physical therapists ranked 7th in a list of 50 “Best Jobs in America” featured in the November issue of CNNMoney.com. The profile features an interview with APTA member Jennifer Gamboa, PT, DPT, OCS, and examines education requirements, job satisfaction, and salary estimates. APTA is also cited for explanation for the growing demand for the profession. On October 23-24, the Departments of Physical Therapy and Occupational Therapy offered a joint event for Alumni Weekend during UCA Homecoming. A two-day continuing education course entitled Constraint Induced Therapy and Current Concepts in Neuroplasticity was presented by Dr Steven Wolf and Dr. Sarah Blanton of Emory University and Veronical Rowe of the UCA Occupational Therapy Department. On Saturday, DPT students, alumni and faculty members gathered for a cookout in front of the PT Center during Homecoming tailgate festivities. The DPT Class of 2009 and the Department of Physical Therapy held Convocation Services on August 9 in Reynolds Performance Hall with a reception following in Brewer Hegeman Conference Center. Dr. Bill Bandy, Professor of Physical Therapy, was the invited speaker. The class presented the Outstanding DPT student award to Kim Lancaster. Dr. Steve Forbush, President of the ArPTA presented the ArPTA Student Clinician of the Year to Summer Lewis. In addition, several third year students were awarded physical therapy scholarships including the Joe Finnell PT Scholarship winners – Alexis Smith, Park Tipton, Shane Irgens, and Paige Kibbey and the Thomas Meadows Memorial Scholarship winner – Park Tipton. Grubbs Family with Madeline A. Grubbs Memorial Scholarship Recipient Alexus Smith. Recently, during the Department of Physical Therapy Convocation Services for the graduating class of 2009, the newly endowed Madeline A. Grubbs Memorial Scholarship available to third year PT students, was awarded for the first time to Alexis Smith. Pictured below, Nat Grubbs, his wife Tracy, and their daughters Meredith and Emily attended the Convocation services held on August 9, 2009 in the Reynolds Auditorium. Mr. Grubbs, an alumnus and former instructor in the PT program, spoke to the audience about the scholarship named in honor of his infant daughter noting a good thing that was brought about because of support of his students and alumni of the program to support the education of physical therapy students. Professors and students are utilizing a new state-of-the-art laboratory this semester for the first time for Gross Anatomy. The 4000 square foot structure was completed at the end of 2008 and utilized for the first time during Spring of 2009 for neuroscience courses in PT and OT. The lab includes a student vesitbule with individual lockers, 14 cadaver stations, 9 wash stations, 8 neuroscience tables, AV system (distributed speakers, flat panel displays, boom camera), and ventilation system (overhead air curtain, low air returns).